When planning a home renovation, the first crucial step once you’ve got your ideas together is to get an estimation of the costs from professional renovators. That’s why it’s essential to know what to look for in a quote so that you can make an informed decision when deciding which provider to go with. Avoid unnecessary heartache with our insightful tips for assessing a renovation quote. High Gloss Or Matte Finish In The Kitchen? 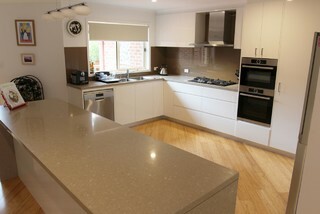 Choosing the right finish for your kitchen surfaces is a key design consideration when renovating. Since both a high gloss and matte finish works well in a kitchen, often people get very hung up on which to choose. To make the decision easier, here are some key considerations to help you decide on your finish which matches the design of your new kitchen and the feel you’re looking for. Many homeowners are stuck with indecision about whether to go with high gloss or a matte finish. This hangup is almost always due to homeowners not choosing the basic layout of the kitchen and important design features that will make the decision for the right finish a whole lot easier. Before you even consider your finishes you should have decided the appliances and sinks to be used as these will have an impact on the cabinetry layout which will in turn affect the type of finish you choose. You should also have decided on the lighting, including the number of lights and their approximate placement so you can choose a complementary finish. A high gloss finish as the name suggests will rebound light around a kitchen with its shiny surface and combined with a lot of added lighting in a kitchen can cause too much glare. If you do decide to go with more lighting (especially if there are not many natural light sources) then going with a matte finish can avoid the high beam effect. When deciding between a high gloss vs matte surface in your kitchen, you should first ask what’s the look you are trying to achieve - a traditional style or a more modern and contemporary look? It is argued that a matte finish is more suited to a traditional looking kitchen, although it is currently trending to use a matte finish on cabinets in modern kitchens. A matte finish can achieve a lot more muted look and can make cabinets look more true to colour, in contrast to using high gloss where cabinet fronts look brighter or darker than others. High gloss kitchen cabinets and benchtops give a sleek and shiny almost mirror like finish, especially when you choose flat cabinet fronts. As a modern kitchen is often associated with a lot of white and shine and so many go with high gloss to achieve a contemporay look. However you need to recognise that it’s not just the finish that creates a modern and contemporary feeling kitchen - you also need to create a minimalistic, clean look overall (best achieved through optimising storage solutions) utilising stainless steel and sticking to a neutral pallette. Another important consideration is the size of your kitchen. If you are dealing with a small kitchen area then you will need every assistance to create the illusion of space. Using a matte finish won’t make your kitchen look any smaller, but as it doesn’t reflect light very well it certainly won’t help in improving the appearance of the size of the kitchen. 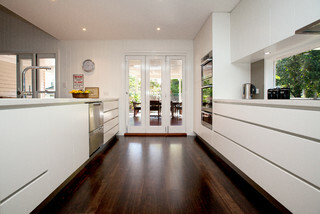 When you have a small kitchen area, many choose to go with a high gloss finish for its reflective properties. The lighter shade you go, with white being the best - the higher amount of reflective light and the greater the feel of space you’ll create. That’s not to say that high gloss doesn’t work in a large kitchen, however in a small kitchen you need to recognise that the glossier the finish the better it will be for creating the illusion of space. Do you have kids that are prone to opening cupboard doors? A high gloss finish can show fingerprints and smudge marks which is something parents should consider even though they are easy to remove with a non-scratch microfibre cloth. To reduce finger prints on high gloss kitchen cabinets, consider choosing cabinets with handles so you’re touching the actual surface less. A matte finish is often used to cover surface imperfections as the finish does not reflect light like a high gloss surface, hiding things like scratches. A drawback to a matte finish when it comes to the cleaning department is that some matte laminates have a texture to them that can also hold dirt and prove difficult to clean. This can be easily avoided by choosing a sample with a material that has a smooth flat finish. STILL UNSURE - WHAT ABOUT A SATIN FINISH? If you are still undecided on which finish to use, the good news is there is a third option - a satin finish. For a compromise between the high gloss and matte finish, a satin finish can give a kitchen a fresh and contemporary look - not too glossy, not too muted. There are many benefits to choosing a satin finish to your kitchen. A satin finish reflects more light than matte and stands up well to cleaning. It also works well in a high traffic area like a kitchen and provides a more sleek and silky finish than matte. The market now has many options to achieve the look you are after, with different layers of gloss available for kitchen cabinets and benchtops. At the end of the day, you should always invest in quality no matter what finish you decide to go with. Whether high gloss, satin or matte – a high quality finish will stand the test of time. Nu Look is always asked by clients what finish to go with and we think it's important to workshop with our clients in the design phase the types of products that are available so you have a successful kitchen renovation. Contact us today to organise a free consultation to discuss your plans and how we can help. As life expectancy increases many Australians are wanting to stay in their own homes for as long as possible; allowing them to remain close to their local community and family. If this is a choice you’re considering, it’s important to remember that changes may be required to your home to ensure your comfort and safety as the years go by. There’s no denying that most people as they age become frailer which increases the risk of falls and related injuries. Some day-to-day activities around the house can become difficult and even present a safety risk if a home is left unaltered to accommodate for living needs. Fortunately, renovating your home to meet new requirements allows you to continue to live independently for longer. When brainstorming ideas for remodeling your home, consider an open plan arrangement so you can move around easily in your house and safely access the things you need on a daily basis. One option is to combine the kitchen, dining and living areas together. While the move to combine living areas has been on trend for a few years now, the exercise can go pear-shaped without proper planning. Before changing any space, it would be best to get expert advice on the best place to start. Your discussions should include how you can improve the livability of a space, how best to create the illusion of more space and maximise on natural lighting. For those who live in a multi-storey house, an important feature when redesigning is ensuring that a bathroom and a bedroom is available on the ground floor for easy access so you can minimise taking the stairs if needed. An ensuite to an existing bedroom may be possible depending on the size, position and layout of the space. Using products which can be multi-functional such as grab bars that can also act as substitutes for towel rails and toilet paper holders. 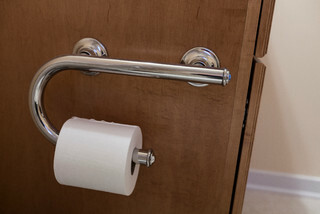 Adjust the height of various items such as the toilet, cabinetry and basin to aid accessibility. Create a walk in shower space that can accommodate for wheel chair access if required. In addition to being easier to clean, having a shower space that can allow for ease of access and a relatively level flooring is a much safer alternative. Install an adjustable hand shower rail and possibly a shower bench. Both these items will make showering and self-care a lot easier. With the help of an experienced builder and designer you can create a space that works perfectly for your needs, but won’t mean sacrifices when it comes to resale of your home later down the track. Flooring should be revisited as you get older as slippery surfaces can pose a safety risk which can be easily avoided if you get the surface right. That said, safety is the not the sole factor when choosing the right flooring, maintenance requirements as well as aesthetic considerations should also be factors when deciding on appropriate flooring. We’d suggest avoiding very hard surfaces like natural stone and ceramic tiles. While some choose to go with carpet in their home to avoid the risk of slippery surfaces and to keep warm in winter, carpet can be difficult to keep clean and maintain- an inconvenience that is hard to justify as you get older. For ease in cleaning and maintenance you can’t go past wooden floorboards that in addition to being more durable than other flooring surfaces also brings an aesthetic appeal which adds value to your house when reselling. The lighting in rooms where accidents are more likely to occur - in particular the kitchen, should be reviewed to prevent accident and injury. To get the lighting right, look to maximise natural light were possible by introducing an additional window or skylight. If these aren’t an option, consider opting for recessed lighting or task lighting to improve visibility when you are cooking. You may also want to review the placement and height of light switches, so that they are easily accessible when entering and leaving a room. 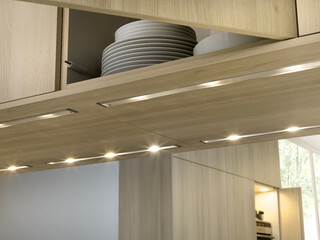 There are many innovative products on the market to provide greater lighting in a kitchen such as strips of LED lighting that can be introduced under the countertop or can really light up a walk in pantry so all the nooks and crannies are made visible. If you don’t already have contrasting surfaces such as your countertops to your flooring, it would be beneficial to do so to make your kitchen safer and easier to see things. Nu-Look specialises in project planning and delivery for renovations in the kitchen and bathroom so that you get the most suitable living arrangement as you head into retirement. Call us for a free appointment and we can arrange a time to discuss your changed living requirements.